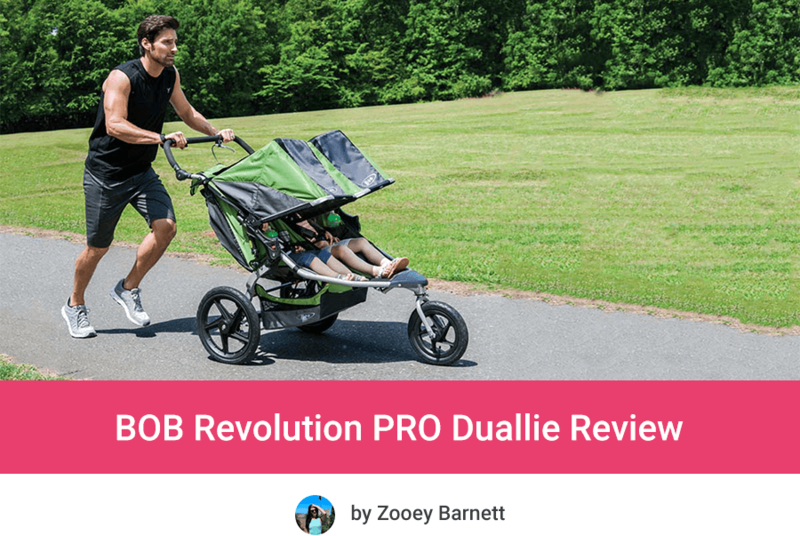 BOB Revolution PRO Duallie - Perfect Stroller For Jogging With Twins? Would you like to keep up your active lifestyle and regular workouts with two kids? Or maybe you want to get back into shape after the birth of your twins? There’s no easier way than jogging with BOB Revolution PRO Duallie. This is perfect double running stroller for twins or kids of a small age difference. It’s not only a great choice for serious runners and parents who like outdoor workouts. It may be awesome stroller for those who like off-road walks and occasional jogging as well. With double BOB stroller you can take your twins or your infant and toddler for cruise on any type of terrain. 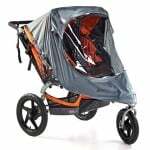 36 lbs $$$$$ Top quality stroller for advanced runners, as well as for beginners. Not only for twins, but also two kids of different age. 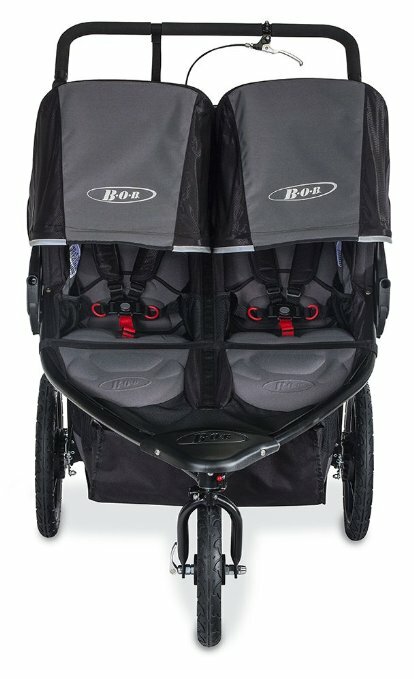 Are you looking for a running stroller for two kids? Here is my ranking of highly-rated double joggers. This double BOB jogging stroller is equipped with lockable swivel front wheel and probably the best suspension system on the market. You can use BOB Revolution PRO Duallie for running, hiking, roller skating, light jogging or strolling over uneven surface. 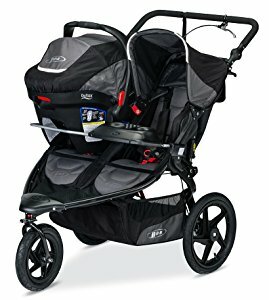 Just like BOB Revolution PRO Single is one of the best strollers for jogging with one child, this model serves perfectly for running with two kids. This model has polymer wheels with pneumatic tires that absorb shocks and allow you to jog even on the toughest terrain. The front wheel is smaller – 12.5” while the rear ones are bigger – 16”. The tires are filled with air and they need regular inflation in order to continue shock absorption. Inflating is very easy and you can do it with regular bike pomp. There is also swiveling front wheels. It makes the stroller easier to maneuver and turn. 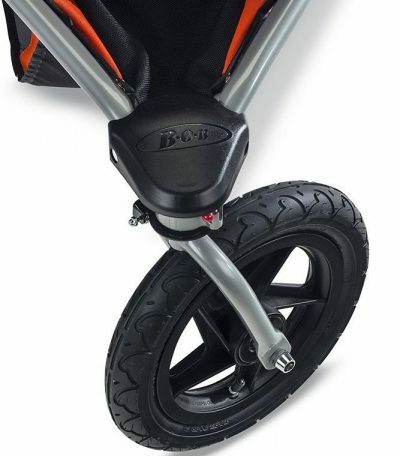 You can also lock forward this wheel for added stability which is really useful when you are pushing the stroller on uneven, rough terrain. We tried this stroller on wooded trails, old bumpy sidewalks and sandy beaches. BOB handled everything flawlessly. Want to find out where other parents have taken this stroller? Check out customer reviews on Amazon. Thanks to splendid suspension system, your babies will have smooth rides no matter what terrain you choose. You can jog on bumpy grass, beach, uneven paths in the park – this stroller will handle any type of terrain and your little passengers won’t get bumped around during the ride. The suspension system has two position for lighter and heavier passengers. You can also adjust it to the surface you are going over with your children. I must admit that BOB jogging strollers have probably the best suspension among all modern strollers. 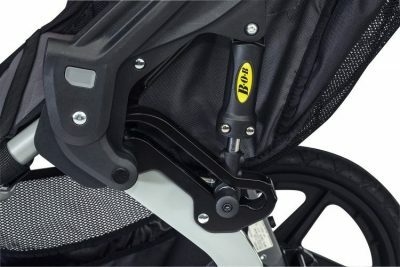 Many strollers have only the foot-operated parking brake (which secures stopped position), but BOB Revolution PRO Duallie is also equipped with the handbrake which gives you more control over the stroller’s speed. This is great feature for parents who like to run on hilly terrain. You can be sure that the stroller won’t get out of your control. The parking brake is flip flop friendly and it is easy to push even with bare foot! Many moms were asking me if PRO version with the hand brake is worth spending few extra dollars (it is more expensive than the Flex version for example). I always say that the handbrake is a great investment especially if you will run or walk on hilly roads. The handbrake will let you to control the stroller better when you are running on bumpy ground or down the hill. The stroller is large and quite heavy itself and when you add the passengers’ weight and the stuff you take with you (diaper bag, bottle of water, snacks etc…), you realize you are pushing “a beast” that weighs at least 90 pounds! I can’t imagine running with two kids and their gear without a handbrake. Thanks to it I never lose the track. In my opinion, handbrake is an investment in babies safety! This is another useful feature that not every jogging stroller has. BOB 2016 Revolution PRO Duallie is equipped with a nicely padded handlebar which can be set in nine different height positions. It makes pushing very comfortable for parent of different height. I’m quite short person, but my husband is much taller than me so it is very important for us to have adjustable handlebar. There is really wide range of heights so even very small and very tall parents can push the stroller effortlessly. BOB really cares about babies and parents safety. 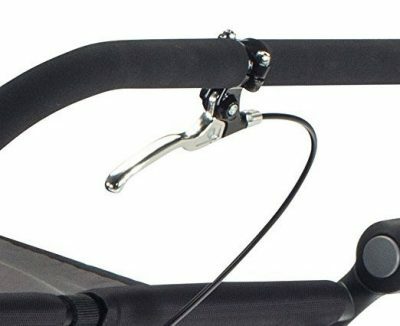 That’s why this model is also equipped with a safety wrist strap that is attached to the handlebar. You should put this strap around your wrist. Thanks to it the stroller won’t run away from you. The seats are very nicely padded for the passengers comfort. Each seat can accommodate a child up to 50 lbs and reclines separately from vertical to 70°. To recline the seat you just have to pull the straps on the back. Parents love this deep recline which is perfect for naps on the go – but keep in mind that it’s not safe to run with fully reclined seats, you should use it only during walks. Seat back adjustment is easier in 2016 model than previous versions and you can lower the back rest with one hand. Each seat has also vented top which you can use in fully reclined position or you can close it with a cover on more chilly days. Moreover the back rest goes up to truly upright position – the kids can sit up and observe surroundings without having to hold on to try sit more upright. The seats are padded with comfortable fabric and have 5-point harnesses. There is however one part of the seat (between the bottom of the seat and the leg rest) which may be a bit rough for baby with very delicate skin. 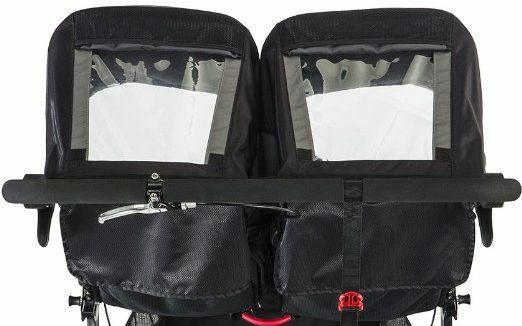 Like every other double BOB stroller this one is also equipped with two large, individually extendable sunshades. They can be set in five different positions to give the babies up to 125° range of coverage. Each canopy has big peek-a-boo window so you can check on both of your passengers during the whole trip. Unfortunately the windows have Velcro closure which may be a bit noisy. There is a large basket underneath the seats, two backpockets – one on each seat back. You can keep there your essentials during running. There are also four mesh pockets inside the seats (one on each side) which allow the children to keep their sippy cups or toys at hand. I love how big storage space this stroller offers. When you go out with two kids you need A LOT of stuff and with this double BOB jogging stroller you can be sure you will have enough space for all of your necessities. BOB 2016 Revolution PRO Duallie has a new black frame which gives the stroller more elegant and sporty look at the same time. The frame is made of lightweight materials and it is designed to fold in two steps. Let’s be honest. This stroller is heavy – it weighs 36 lbs which makes it a bit difficult to carry or lift to the trunk. But it has so many excellent features that compensate its weight and size. The stroller is sturdy, made of high-quality materials, rides smoothly even on rough terrain. And when you push it you actually don’t even feel the weight (even with two toddlers and on rough terrain)! Storage and transport is not very easy, because BOB Revolution PRO Duallie is still bulky even when folded. You should check what are the dimensions of the folded stroller and if they fit your trunk. We never had a problem with folding it or fitting into our SUV trunk. It can be closed in two steps. Then you have to bend down and lock it manually, since there is no automatic lock. 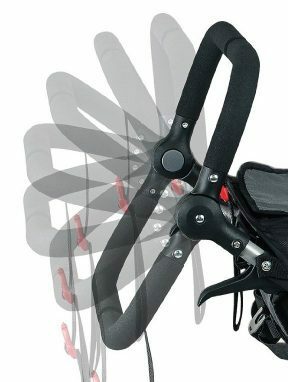 The safety wrist strap is designed to provide a handy lock to keep the stroller folded. You can also easily take off the wheels to make the stroller more compact – it’s quick and easy but some parents find it annoying, especially if you have to do this every time you want to put this stroller into the trunk. You can jog with this stroller when your babies have perfect neck and head control (which is about 6-8 month old). Before that you can still use this stroller for walks, but you will need an infant car seat and adapter for it. BOB Revolution PRO is compatible with many car seats. If you plan to use this stroller with an infant car seat remember to choose the proper adapter. There are special adapters for 2016 version of this stroller. We were using BOB B-Safe 35 infant car seats by Britax. There are also adapters for Chicco, Graco and Peg Perego car seats as well. For example you can check the Chicco adapters on Amazon. There are also other models. The only drawback is that you can’t swap in two car seats. The car seat adapter, which you need to purchase separately, is designed to accommodate only one infant car seat. This was a little disappointing for me, because I couldn’t use it for my newborn twins. But it’s perfect option for those who have a toddler and newborn. 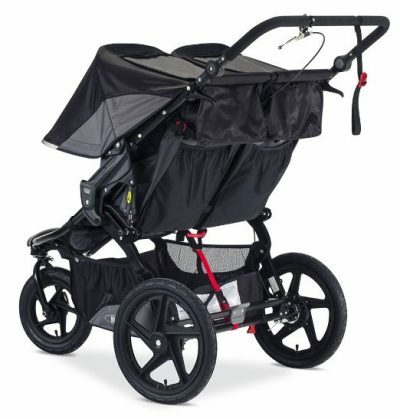 BOB 2016 Revolution PRO Duallie Stroller is currently available in one color – black (with grey elements). If you want to find the current price and see available discounts I would recommend you to check it on Amazon – seller officially approved by BOB. Here you can watch a video from BOB Gear, where you can see for example how to fold the stroller. BOB Duallie Handlebar Console – It allows parents to keep their essentials at hand. There are two beverage holders and a storage pocket, for example for keys and phone. BOB Duallie Sun Shield – If you live in hot climate or just like summer strolls, this shield is a must-have. It will protect your babies from harmful sun rays and insects as well. BOB Duallie Weather Shield – I always keep this cover in a storage basket, just in case. It will be very useful when the rain surprise you in the middle of your outdoor workout. BOB Duallie Snack Tray – It offers one cup holder and place for snacks for each child. BOB Duallie Infant Car Seat Adapter for BOB & Britax – There are separate adapters for different car seat brands, here is the adapter for Britax and BOB models. If allows to attach one car seat to the stroller and provides the other, older baby with useful tray. This double BOB jogging strollers has 5-year warranty for the frame and 1-year warranty for the components and fabric. For more information check manufacturer official website. 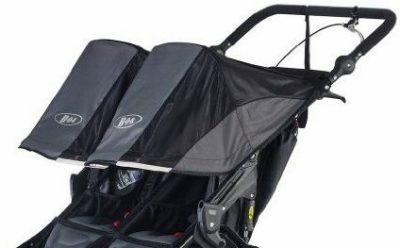 Although this is one of the most expensive double running stroller is it pretty popular and highly rated by many parents on Amazon (check how many reviews it has right now). Parents praise it mostly for smooth and comfortable ride and high quality. 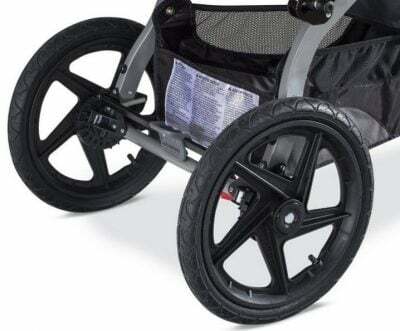 The suspension cushions the ride and the stroller is very easy to push. It handles bumpy terrain and fast running paces. Two brakes give parents better control over the speed – the handbrake is very useful especially when you are going downhill with older and heavier toddlers. It fits through normal doorways. Customer also like how well built it is. Some parents complain that material on the sunshades is a bit flimsy. Moreover, the suspension needs to be adjusted every time as there is no lockout and the suspension doesn’t go to the previous setting on its own. According to many customers the biggest disadvantage is the lack of accessories at such a high price. In my opinion BOB 2016 Revolution PRO Duallie is a smart investment, considering all its features that provide comfortable and safety ride. This stroller is a great option for active parents and those who live in rural or hilly area. 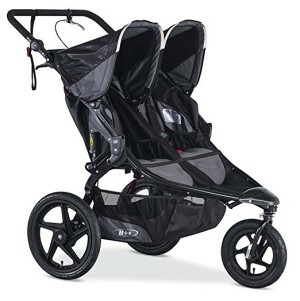 If you love running or like to jog occasionally this double BOB stroller may be perfect solution for you. 1. It will provide your babies with smooth, bump-less ride, even on harsh terrain like dirt roads, unbeaten trails, sand or snow. The suspension (probably the best of all strollers) will protect your children from negative impact of shocks. 2. This stroller is very easy to steer and turn. You can push it literally with one hand and you won’t feel the weight. 3. Thanks to additional handbrake helps you to control this “beast”, especially when you are going over bumpy terrain or down the hill with two heavy toddlers. Do you want to purchase this stroller? It’s quite expensive so don’t forget to check if there are any available discounts. BOB recommends Amazon as one of the trusted and official sellers. Click here to find the current price on Amazon.